Sitting At The Foot of the Mountain: Hey, You CAN fly! Obviously, the coveys host a whole range of sizes and ages: some of the little ones are clearly hatchlings—tiny and very vulnerable. Some coveys are filled with more mature quail—adolescents you might say. They are identifiable not by the i-Pods in their ears but by their brownish feathers and near-to-adult size. But, no matter what age is in the covey, the adults are frantically trying to keep them together and keep them safe. When they visit my feeders, the male finds an observation spot where he can watch the missus and little ones, and will chirp out quite a warning if danger approaches. Oh, danger does approach: we have a vast array of raptors who swiftly bring death from above. We have red-tailed hawks, Swainson’s hawks, kestrels and turkey vultures (who are not going to win any awards for beauty!) These raptors circle overhead and will drop like stones onto some unobservant creature in the grasses. The vigilance of the male quail is quite a sight. 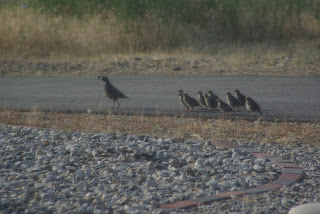 The other night, as I was walking along the river, a rather large covey (a quail Brady Bunch?) was walking along the road, and when they caught sight of me, the female and little ones dashed off the road and into the grasses. The male stood watch until they disappeared. Then he flew into a tree and chirped at them as if to say, “Keep moving! We’re not home free yet—she’s still there!” I quickly walked past the spot, and he continued chirping for a bit longer. The price of life (to slightly alter Jefferson’s famous axiom) is eternal vigilance, and this male quail understood this all too well. The funniest thing about quail is: they can fly. My son James says that these birds are rather stupid, because they forget they can fly…or so it appears to us! 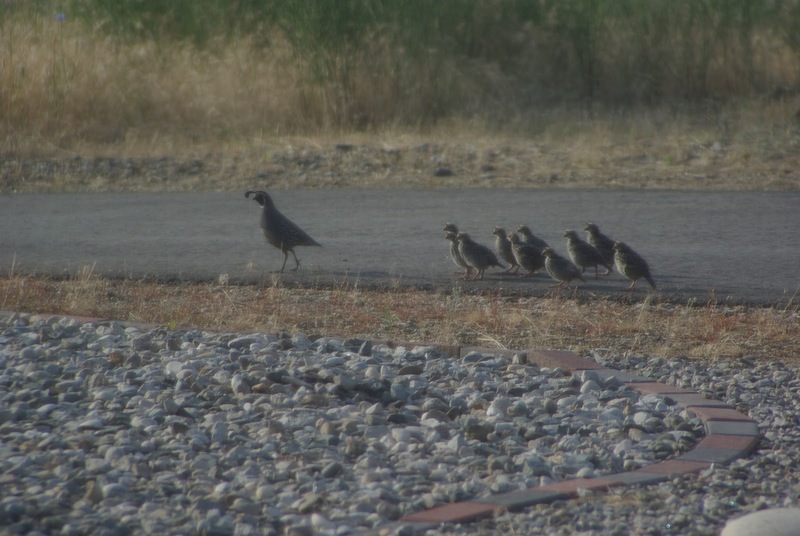 They walk along our road, and I have to drive very slowly, because they run in a panicked cluster, careening from side to side and although I am no expert in quail psychology (it’s a very small field!) I would say they are panicking. If I speed up just a tiny bit, letting them know to move out of the way, they speed up their frantic scampering, and finally, one bright bird takes off and then it’s an “a-ha!” moment for the rest! They all take off, zipping into the nearby trees with a lot of (self-congratulatory?) chirping. If I were a flying predator, then a panicky take-off might drive them right into my eagerly awaiting talons…but I am on the ground, they’re on the ground, and it’s just chaos for these little guys and frustration for me. Why do we so quickly forget who we are in Jesus? We can fly! Yet, we stay grounded, running for dear life up the road, frantically screaming and dodging in and out, not quite sure which way to go. We are vulnerable. There are indeed threats out there to our safety and well-being. Satan is described as a “roaring lion” and that sounds dangerous. His goal? To devour us. He’s no different than the red-tailed hawk that flies overhead, waiting for a less-than-watchful quail and them BOOM! down it drops and there’s one less quail in the world. But remember our ever-vigilant male quail? He’s watching and chirping, reminding his brood that there is danger out there. Wow! Yes, we need to be careful, but we need to fly in His freedom, and not be grounded by fear and panic. Because, and this is key: “You, dear children, are from God and have overcome them [those who deny Christ] because the One who is in you is greater than the one who is in the world.” (1 John 4:4). Be vigilant, but remember: He has given you wings! I feel fear, Lord, and I feel panic. I run all over the road, not sure where to go and how to get there. But You are my Refuge, and I must run to You! Remind me, Lord, each day, that You have given me wings to fly, and I honor You when I celebrate the freedom I have in You! In the Name of the One Who sets me free, amen.